To celebrate Queen Elizabeth II's 90th birthday and her love of all things four-legged and British, we have brought together some of the country's most loved dogs and iconic canine figures. The Queen is synonymous with the Corgi all around the world. 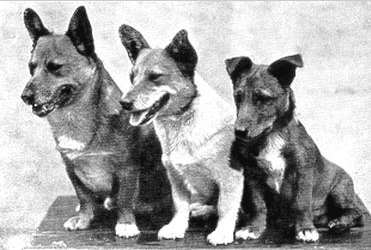 Her love of the breed stems back to meeting the Corgis owned by the children of the Marquess of Bath, after which her father, King George VI, brought home 'Dookie' in 1933 for his daughters, the Queen and her sister, Princess Margaret. Until the Queen's family moved to Windsor, Dookie, once chosen by King George VI, was boarded in Surrey with his breeder although did visit and spend time with his family at a favourite retreat in Scotland, Glamis Castle. At the time kennel staff joked that the dog had become 'snooty' after being selected by the royal family and began calling him 'the Duke' which was shortened to 'Dukie' and finally 'Dookie'. His new family loved the name, and it stuck! There have been 16 dogs who've been a part of BBC's 'Blue Peter' TV show since 1962 including five Guide Dogs in training. Until 2008, it was thought that the first dog was Petra, a female cross-breed, who was a big part of the show from 1962-1977, however in 2008 it was revealed by former editor, Biddy Baxter, that before her there was a little puppy who sadly passed away after first appearing on the show just before Christmas in '62. Instead of informing viewers for fear of upsetting them, the director and producer of the show bought a similar looking replacement puppy, who was Petra. Petra spent 15 years at the helm of the TV show and eventually left the show retiring at home with the show's presenter, Peter Purves, who had become her handler. If your dog loves to snooze in comfort, then these faux fur pet throws could be just what you’ve been looking for. Unbelievably stylish, soft and sumptuous, they will look and feel fabulous whether on your sofa or even OnYourBed! Backed with cuddle soft Velboa, they’re incredibly warm and your dog will feel a million dollars snuggled up on one. Machine washable and available in sizes Small to Extra Large, you’re sure to find a size which best fits your four-legged friend. Additional bed ranges are also available online including a tartan travel throw and luxury cushion beds. Get 10% discount online using code: nps2016 (valid until 10th May 2016). Winston Churchill was famously associated with the British Bulldog, the two-time Prime Minister, who served between 1940 to 1945 and 1951 to 1955, was referred to by the Russians as a 'British Bulldog' during his first term as PM and it's likely this is the wartime cartoon which in fact sparked the Russian's nickname for Churchill. According to Richard Langworth, the editor of The Churchill Centre's quarterly journal Finest Hour, the cartoon, pictured above, was first published in the Daily Express, 8 June 1940. At home Churchill's main canine confidente was a Poodle named Rufus, and later Rufus II. It's no surprise that with more than 8 million dogs in the UK, TV and film writers often incorporate dogs into family settings as it's reflective of a huge part of our society. In recent times, the yellow Labrador from ITV's period drama 'Downton Abbey' was a beloved national treasure (until her name, Isis, became a problem the show wanted to distance itself from) but perhaps the most well-known soap star dog is BBC's Belgian Shepherd, Wellard, who first appeared on on the 'Eastenders' set in 1994 and made 'his' final appearance in 2008. Wellard the four-legged friend to Robbie Jackson (played by Dean Gaffney) and was written as a male, but actually played by three females primarily, whose real names are Zenna, her daughter Chancer, and her granddaughter Kyte. The award winning Original Grippy range is designed and handmade in Great Britain. Featuring an innovative multi-loop design, this unique lead allows you to walk your dog at varying distances and bring your furry friend to heel with ease and control. The colourful sets made with cushioned webbing mean you can step out in style and comfort this summer! “I’ve owned dogs for 50 years and this is the best lead I’ve ever had!”. Visit us online to find out more and why not pop down and see us at the first ‘Countryfile Live’ event at Blenheim Palace this Summer, celebrating the Best of British. British poet Lord Byron, who was a leading figure in the Romantic movement, is regarded as one of the greatest British poets. Known by many for his lavish lifestyle which saw him both celebrated and admonished in life, his ancestral home was Newstead Abbey in Nottinghamshire and it's where his dog, Boatswain, a Newfoundland, is buried. Boatswain died of rabies in 1808 after being bitten by a rabid dog while following his habit of accompanying the post boy into Mansfield and on his tomb (which is larger than his owner's) is Byron's 'Epitaph to a Dog'. This poem will no doubt strike a chord with many a dog owner and is pictured below to read. Hotly contended on whether he or his friend John Hobhouse wrote the first two lines, it's generally accepted that Lord Byron had originally planned to use just the last two lines as the inscription. Whatever the origins, Lord Byron clearly thought it apt for his beloved friend as his wishes had been to be buried at the Abbey with his dog. The first dog to win a talent show on TV was Pudsey, who won the sixth series of 'Britain's Got Talent' with his owner, Ashleigh, in 2012. The duo has since gone on to perform around the world to millions. The pair spoke to K9 Magazine (here) appeared on K9 Magazine's cover not long after they'd won the show. Pudsey, now just over 10 years old, has lent his name to TV shows, books and even a movie. Here they are performing in front of the Royal Family at the Royal Variety Performance in 2012, part of their prize for winning BGT. Since the BBF's won the talent show, it's become synonymous with its canine entries hoping to emulate Pudsey's success. At last! A hard-wearing, good-looking, deep and snuggly dog bed that washes, dries and springs back beautifully into perfect shape. What’s not to love? Expertly hand-crafted here in the UK, our dog bed, Hector, is the ultimate in comfort, durability and style. A combination of the finest grade, hard-wearing cotton in our fabulous, striking prints and thick, cosy Sherpa fleece makes Hector the bed with the bow-Wow Factor! One of Britain's most famous doggy tales is of Greyfriars Bobby, a story which embodies the loyalty we all know is uncompromising and given freely by our canine friends. The best known version of Bobby's story is that he was owned by a man named John Gray, who worked for Edinburgh Police as a night watchman. The Skye Terrier is said to have spent 14 years at his master's graveside at Greyfriars Kirkyard until he himself died on 14th January 1872. Several statues commemorate Greyfriars Bobby around the local area and attract tourists who visit to discover more about this famous dog who has inspired many books and even multiple films, the most recent was released in 2006. Although some have questioned the story over the years, as dog owners we all know the loyalty and unconditional love which our four-legged friends give, so they have very often been swept aside in favour of remembering the tale as it was once told of a dog who loved his owner and wanted to protect and guard him, even after he was gone. Made from 100% Pure Essential Oils, the WildWash range includes Shampoos, Perfumes & Fragrances, and Remedies, such as their Healing Paw Balm. Truly natural, the products have been created to help you find the perfect match for your pet. Whether your dog has itchy, dry or sensitive skin, a greasy coat or you’re looking for products which help de-stress, WildWash will have something to suit made only the best and most natural ingredients. Made in England and pH balanced to suit your pet’s skin, the range contains absolutely NO Parabens, Phthalates, Phosphates, Sulfates, Petrochemicals, Synthetic or Semi-Synthetic Fragrances or PEG’s. HM The Queen is a patron of over 600 organisations and charities including Battersea Dogs & Cats Home, whom she became patron of in 1956. In 2015, she officially opened Battersea’s Mary Tealby kennels and on hr 90th birthday Battersea's 'Regal Beagle' has wished her a happy birthday. Who's your favourite canine figure from history? Let us know by commenting below - we love hearing from you!